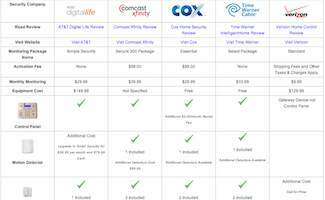 Comcast Home Security vs Cox vs AT&T vs Time Warner: Who’s the Best? The economy and tighter household budgets paired with improved alternatives have led many consumers to cancel their cable television service and turn to other, less expensive options, such as satellite TV, streaming and other online services. 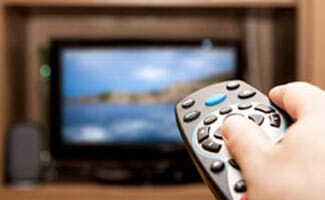 Subsequently, the cable industry faces many challenges, including finding new ways to keep subscribers. In recent years, cable service providers and telecommunication companies have become increasingly interested in home security and home automation. Many are using the term Smart Home to describe this new revolution in remote home control options. These services can be bundled with current service packages and delivered over their existing broadband infrastructure. New wireless technology in home security has further reduced the barrier to entry into this market. We have summarized the home security and home automation offerings from the nation’s largest cable and telecommunication companies, so you can evaluate if these options might fit your home security needs. Be sure to check our companion comparison table to view the features of each company side by side. If you’re interested in other home security companies, feel free to read our annual best home security systems review. Some of the service providers we profiled indicate they are UL listed or UL certified. UL is an independent safety science company that certifies, validates, inspects, and audits to help companies understand a wide range of issues, including compliance and regulatory issues. They are well-known and widely respected around the world due to their knowledge and expertise in safety solutions. While these bundled services may be less expensive, it is important to remember that cheaper is not always better. Make sure you know what you are paying for and understand the tradeoffs that may lower costs. Tradeoffs may include: customer service/support in times of need, a less safe communication method (broadband or phone line vs. cellular), lack of monitoring, slower response time, and false alarms. Proceed with caution if you decide to bundle your home security with your other home services. Unlike many other competing cable and telecommunications companies, AT&T enables customers to use their home automation and security service regardless of their broadband carrier. Customers can monitor and adjust systems in your house, like indoor and outdoor cameras, appliances, lights, thermostats, door locks and water mains. You can manage your home through your computer, tablet, or smartphone, and the Digital Life mobile app is now available for iOS, Android, and Windows Phones. Additionally, customers with existing home security systems can reuse working, wired door and window contact sensors. Not available in all states or outside the U.S.
Below are optional add-ons, which also come with an added upfront cost depending on the equipment you get. CenturyLink’s Smart Home security and automation system is fairly new to the market. It appears to be a pretty high tech system with all the bangs and whistles. Since they are fairly new it’s difficult to get much user feedback about them. A couple things we don’t like are that you are locked in for 3 years and they charge additional fees for activation and installation. CenturyLink has an extensive list of add-ons available for these packages as well. If you’d like to customize your package, view CenturyLink’s website to see the full list. Comcast Xfinity offers a secure network and 24/7 monitoring by a UL-certified central security station. Each system also has battery backup in the event of a power failure and cellular backup in case of a network interruption. Customers who opt to purchase a security camera also have full access to a live video feed via the web or smartphone and can save video clips and pictures to a personal web portal. Comcast’s home automation feature enables you to control the system’s add-on devices, including lighting and thermostats, and keep schedules of these activities. Additionally, you can remotely check the status of every sensor in your home, arm and disarm your system, and manage every detail of your security settings. There are also bundling packages available if you’d like to get TV or Internet through Comcast as well. Cox Communications rolled out its home security and automation services in March 2013. Cox Home Security offers intrusion and home safety monitoring, including fire, gas and flood, as well as remote system access and control. The company’s professional monitoring centers are UL listed and CSAA 5 Diamond certified. They are highly trained in public safety and customer service, and they verify each alarm with a phone call before sending emergency services in an effort to avoid false alarms which often come with city fines. Cox Home Security is available to residential consumers in select markets, and pricing may require a 3 year service contract and subscription to Cox TV, Internet, or phone service. The company also offers a Takeover Upgrade Kit to enable customers to use existing, compatible door and window sensors. Cox Communications has confusing packaging and pricing information so we definitely recommend you check out their website so you fully understand it. And if you’re serious about using Cox Home Security be sure to ask the rep what equipment will be included and at what price. Time Warner Cable first launched IntelligentHome, its home management and security system, in 2011. IntelligentHome enables customers to remotely access and control their home security settings, lighting, and thermostats from a computer, tablet, or smartphone. And, customers who opt to install a camera can view a live video feed. The in-home touchscreen also allows users to access weather, news and traffic, and even post photos. Time Warner cable owns and operates their CSAA 5-Diamond Rated Emergency Response Center, which give you immediate access to emergency services. IntelligentHome has cellular and battery backup, as well as a manually activated emergency panic alarm. The company offers free standard installation to customers who currently subscribe to another provider’s home security service and want to switch to IntelligentHome. Additionally, customers can upgrade their current security system and use existing equipment if you are looking to switch providers. Time Warner monitoring starts at $39.99/month for all their packages. Verizon Wireless began rolling out their home automation and security service in 2012 and quickly shut them down. Verizon no longer offers home security. Will You Choose A Cable Company for Your Home Security? Choosing the right home security system is a one of the most important decisions you will make to protect your home and family. When you know all of the options available, you can get the right level of protection while staying within your budget. Cable service providers and telecommunications companies have a built-in infrastructure, which enable them to provide service comparable to established home security companies while keeping their prices affordable. However, major cable companies have had a history of poor customer support. When we rank the best home security companies in our Reviews of Home Alarm Systems article, we place a major emphasis on customer support and user feedback. Make sure to do your research before signing up for a long-term contract.